Why Is Johnson Controls Worth $45? Johnson Controls (NYSE: JCI) generates its revenues from two segments, namely Building Technologies & Solutions and Power Solutions. The former is a global market leader in engineering, developing, manufacturing, and installing building products and systems around the world, including HVAC equipment and controls, energy-management systems, security systems, and fire detection systems; while the latter is a major global supplier of lead-acid automotive batteries for virtually every type of passenger car, light truck, and utility vehicle. JCI also supplies advanced battery technologies to power start-stop, hybrid, and electric vehicles through its Power Solutions segment. We have a $45 price estimate for Johnson Controls, which is higher than the current market price. The charts in this article have been made using our new, interactive platform. We have also created an interactive dashboard which shows the forecast trends; you can modify the key value drivers to see how they impact the company’s revenues, bottom-line, and valuation. For the company’s Buildings segment, its large base of current customers leads to significant repeat business for the retrofit and replacement markets. In fiscal 2017 (year ended September 2017), approximately 27% of its sales originated from its service offerings, and this segment accounted for 76% of the company’s sales. Developing markets are expected to be the key driver for revenue growth in its Buildings segment in the future, as a result of the improved construction spending expected in these countries, as well as the presence of favorable demographics and increased urbanization. 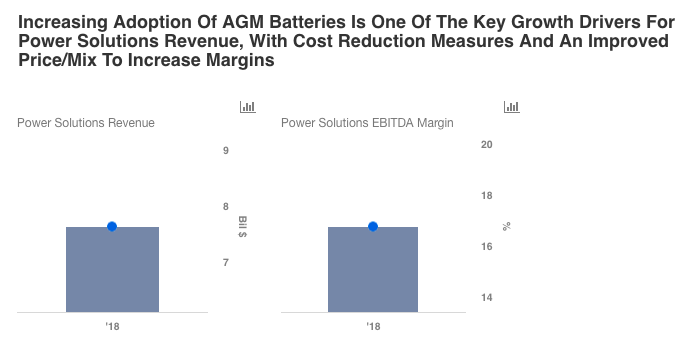 In the Power segment, investments in new product and process technology have expanded product offerings to AGM (Absorbent Glass Mat) and EFB (Enhanced Flooded Battery) technologies that power start-stop vehicles, as well as lithium-ion battery technology for certain hybrid and electric vehicles. These products are expected to result in improved revenues from this division. Roughly 76% of unit sales worldwide in fiscal 2017 were to the automotive replacement market, with the remaining sales to the OEM market. This segment contributed to 24% of JCI’s revenues in FY 2017. JCI committed to a significant restructuring plan in FY 2017 related to cost reduction initiatives. The costs consist primarily of workforce reductions, plant closures, and asset impairments. The company currently estimates that upon completion of the restructuring action, there will be a reduction in annual operating costs from continuing operations by approximately $280 million, which is primarily the result of lower cost of sales and selling, general, and administrative expenses due to reduced employee-related costs, depreciation, and amortization expense. Such measures will result in an improvement in the margins. We have used a P/E ratio of 16.25 for our valuation estimate, but you can modify the multiple in order to come up with your own valuation estimate for the company. How Is Johnson Controls Going To Grow In The Next Three Years? What Are Johnson Controls’ Key Sources of Revenue?